For a general family practice what are the basic features that need to be considered with a medical exam table? A general practice requires an examination table that can be used for a variety of different patients. A standard examination table is a good option as it is flexible and practical, designed to withstand years of use. However, for patient comfort and for ease of examination it may not offer all the position options necessary. 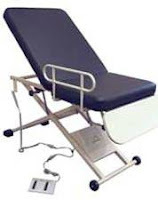 A table that allows for backrest adjustment from the level to various incline positions is often considered a must in general practice exam rooms. This backrest positioning can be done with power systems or through a gas-spring type of mechanism. In addition to being able to position the patient on the table having standard storage in the medical exam table base is also advantageous. This allows the doctor and staff to have immediate access to frequently used supplies and small equipment. Tables may be designed with drawers that open to the left or right side or some tables have drawers that can open either direction. 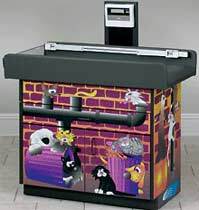 In addition a paper dispenser and cutter that is mounted to the frame is both a time and energy saver between patients. 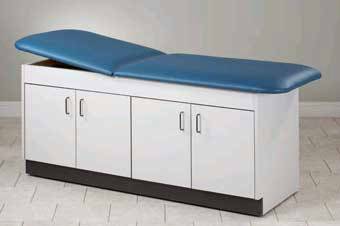 When practices include patients of all ages and health issues a hi-low examination table is very practical. This allows the table to be lowered to a standard chair height for patients with mobility problems to easy seat themselves on the table with minimal need for assistance. The table is then raised to the appropriate height to conduct the examination. I see children in my practice and find an standard medical exam table is just too overwhelming for the kids. What options do I have for something more child friendly? A pediatric table is designed to be very child friendly. These smaller sized versions have all the features that you would expect in an full sized table including paper roll holders, options for power lift features as well as storage within the base. However, unlike those standard models the tables designed for children often have a theme. This can be coordinated to match the décor of the office for very appealing look to the room. Infant and toddle sized options will often offer a built in scale on the table. This is a space and time saver as everything needed for the medical chart can be completed right on the same table. Are there options to build in patient comfort while on the medical exam table? Depending on the model of medical exam table there are several different patient comfort features that may be offered. The ability to incline the backrest and position the leg rest or stirrups to the physical size of the patient provides immediate comfort. Patients also appreciate the upholstered and padded table tops that are designed to minimize the pressure on the back, shoulders and hips when on the table for longer periods of time. Additional pillows and neck supports are offered on some models of tables. Arm rests, safety rails and IV pole attachments that re easily added to the frame of the table can be essential in keeping patients secure. The IV pole attachment prevents the need for additional equipment in the room, providing staff with additional space to move about with ease. For OB/GYN examinations or other types of procedures some tables may also offer a warming drawer. This allows medical equipment to be kept at above room temperature to prevent shock and discomfort when it comes into contact with the patient. This little additional feature can make all the difference in the world to customer satisfaction while in the examination room.